The weirdest thing happened last Thursday. On our more or less regular Gaming Night we planned to play some Blood Bowl Team Manager. Typical FFG game - easy to learn, fast, fun, very solid, very good with keeping the theme. 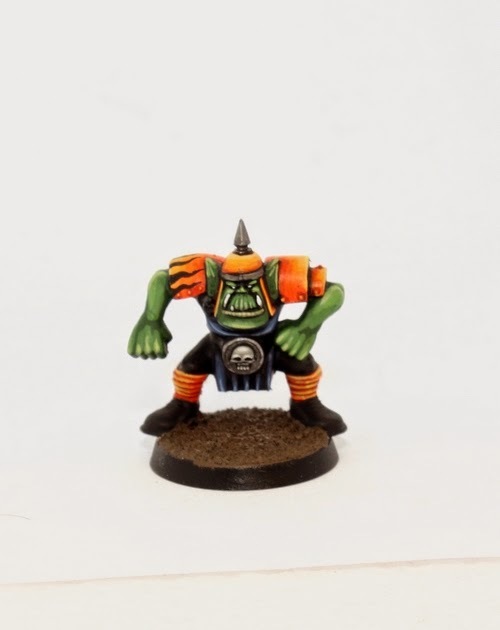 I mentioned in passing that I'd never played proper Blood Bowl. Since the Team Manager game was over pretty quickly (we were only two players to test the rules) out came the real Blood Bowl and we had quick little game. Good stuff. I can see why this, along with Space Hulk, is considered to be one of the best games GW ever published. As things go sometimes I ended up with the plastic Orcs team from the 3rd edition BB box that night and got to painting. The test mini isn't completely done, but that's pretty much the colour scheme I'm going for. What do you think?